Ciaron Harkin is hoping to cap off a great year but making his international debut for Northern Ireland Under-21s when they take on Estonia on Tuesday night. The Coleraine midfielder has been in sparkling form since making the switch to The Showgrounds from Institute back in January. Harkin has played a key role in the Bannsiders impressive form, in fact he has only lost three games to date since joining the club! Now he is hoping to get his chance in the international scene along side club mate Jamie McGonigle. “I am buzzing to be called-up into the Northern Ireland Under-21 squad as I missed the last fixtures as I was in America,” he said. “I doubted myself about getting a call-up, but I’m looking forward to getting a good 10 days with the team. “I haven’t made an appearance yet at international level, but I hope that’ll change this time around. 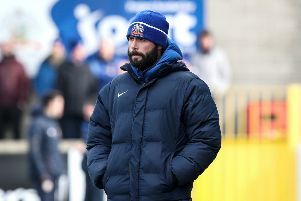 Coleraine currently sit four points clear at the top of the Danske Bank Premiership, but Harkin and his team-mates are not getting carried away just yet. “We are taking each game as it comes and are simply looking for three points,” he said. “We don’t know how far we can go, but we want to keep our good run going. This Saturday sees a big test for the Bannsiders as they welcome the League champions Linfield to The Showgrounds, but it is a game Harkin is relishing. “The Linfield game has come around at a good time,” he said. “Everybody is looking forward to that game and it’ll be a good contest as we are both in good form. Coleraine would encourage fans to top up their match day cards early to avoid a last minute rush for this game. The shop will be open Monday to Thursday 9am-5pm and Friday night before the game 9am-9pm, plus match day.